Tehran, 4 December 2005 (CHN) -- 400 foreign tourists have visited Rayen Citadel throughout this autumn. Authorities believe that the main reason for this success is the good introduction of this historical site to the world. 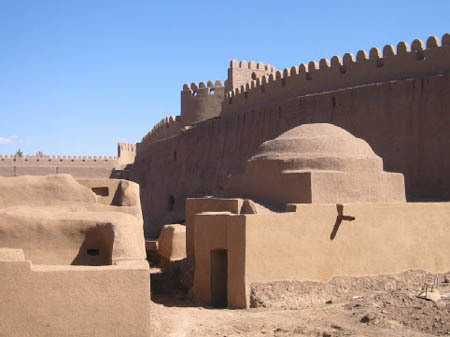 Rayen Citadel is a historical site situated in the south-west of Rayen city and is considered the biggest earthen structure of Kerman province after Bam Citadel which was destroyed in an earthquake a few years ago. The monument dates back to the Sassanid era and covers a 20,000-square-meter area, remaining a symbol of the residential fortresses during the ancient times. Just like other fortresses, it consists of the public quarter and the aristocratic zone. The essential sectors such as Zoor khaneh (gymnasium for a traditional Persian sport), mosque, and stable can be seen in the citadel. Adobe is the main material used in its construction. Last year the Cultural Heritage and Tourism Organization of Iran (ICHTO) announced the introduction of the citadel as part of its main programs. Since then, the citadel is gradually changing to a tourism destination. Introducing Rayen Citadel in the international exhibitions of ITB in Germany and FITUR in Spain was the first step which was took by the ICHTO of Kemran province, and according to Mohammad Jahanshahi, director of the public relations department of the organization, that has been the main reason for the citadel's success in attracting 400 foreign tourists since the beginning of the fall. Producing a 31-minute film about Rayen Citadel by Omid Mehr Varzan was one of the other measures undertaken for introducing the monument. Right now a model of Bam Citadel with a size of 10x10 square meters is being created by one of the famous Kerman sculptors in one of the storehouses of Rayen Citadel. The aristocratic area of the citadel is under restoration and is not yet open to public visits. Two ancient industries practiced in Rayen city, weaponry and knife-making, are due to be revived there by establishing workshops in the area of Rayen Citadel. Setting up a traditional tea house near the citadel is one of the other programs for its tourism development. The hotel and restaurant which were built last year have started working and are ready to host tourists. Local residents believe that Rayen forces won in wars due to the quality of their handmade weaponry produced by locals. It is believed that Rayen Citadel dates back to the Sassanid era, although what is remained today belongs to the Islamic period constructions, mainly Safavid era and afterwards.